Today is the launch of a brand new brand in the denim world: One. Founded by Mark Westmoreland, a veteran designer for Levi’s and Evisu, the project is the culmination of 4 years of hard work. This jean is specifically for denim freaks, the kind of people that like to look at and feel every detail on a pair of jeans, the kind of person that doesn’t wash their jeans for years at a time and throws a party for one when they do. The One jean combines vintage features from some of denim’s biggest stars including Levi’s, Lee, Stronghold, Boss of the Road and Wrangler. The idea being to collect all of the best bits of the best denim designs in history and put them all into one perfect pair of jeans. A beautifully simple idea that took 4 years to create. – Rivets are ‘washer & burr’ – an authentic piece of denim hardware (identified by the cotton threads poking through the middle). – ‘X’ stitched bar tacks on the back pockets are inspired by Lee. – Pocket bags are 9 oz denim, inspired by Levi’s first jean, the Nevada. – To keep things as pure as possible, all sewing has been done by a single stitch machine, using cotton threads, with the exception of the belt loops which are from a twin needle. – The waistband is one continuous stitch, tracking around the patch to the waistband (a Japanese standard). – The back seam and yoke have been hand finished to produce a ‘french seam’ (a technically brilliant finish that’s rarely found in bulky fabrics). – Arcuate stitching spells M W – the initials of designer Mark Westmoreland. Slight knotting might appear in the selvage (a sign of the loom used to weave the denim being re-set). – The heart shaped fly button has been produced by a reproduction company based on a old railway jacket button (that was originally used by Carhartt). Although only intended for the 20 pairs given away by the designer, it was loved so much by everyone who saw it that in the end it ended up on every pair. The unusual back was a suggestion by the factory. 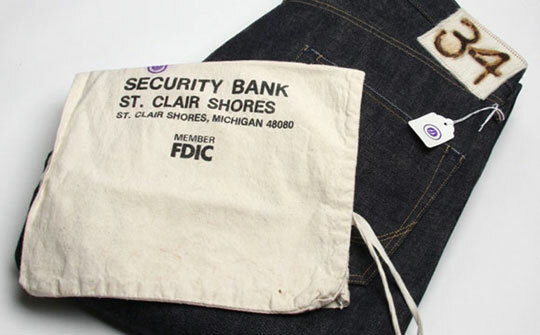 – And finally, all jeans are sold in an old U.S Mint coin bag, with a Japanese one yen in the pocket. After finishing at the factory, the jeans are sent back to the UK for their unique finishing touches. A cotton ‘One’ label is attached – hand sewn by the designer, some have stars, some have arrows, some are plain. Next, the leather patch (made from either cow, sheep or ostrich) is hand branded with vintage irons by the designer in the kitchen of his family home. As well as the label and leather branding, the bartack on the back patch pocket has also been finished by hand. The red cotton thread it’s made from won’t core dye so after it’s been sewn on (by an old ‘Union Made’ that produces a specific amount of stitches) it’s painted by hand with indigo dye. Limited to 100 pairs, and stocked in only 5 stores across the world, these are very desirable threads! You also get to chose what type of patch you want (ostrich, cow or sheep) and which number you want (1-10) … as long as no one else has ordered it. Grab a pair from Oki-Ni now for £345 before they disappear into collectors wardrobes.